Discussion in 'Assets and Asset Store' started by LacunaCorp, Jan 13, 2019. I generally don't like building GUI. I'm a programmer, not a designer, and I don't want to have to drag and drop layouts by hand and wire references up in the inspector. Things break easily, it's cumbersome, and it makes the job take way longer than it needs to. So RMGUI is, in short, a UI library for programmers. If you're familiar with IMGUI, you'll feel right at home here. It's straightforward, very powerful, and incredibly high performance. First of all, there are no components. Anywhere. You create "panels" (maybe a storefront, or a main menu), and override from a Control baseclass. You can then, at any point, issue protected calls (for convenience) to the baseclass to build your UI. It's fully retained, meaning that you don't have to do this every frame- want to add a new element? Just make a new call. Want to remove an element? Just grab it's instance and delete it- everything else is taken care of automatically. Here I put together a very simple demo control based on a game I'm working on. We'll draw a set of 5 entities inside of a masked parent scroll. The Hover style automatically takes any unset values from the Normal style- we just override the rest. In this example, the Sprite and Margin values are automatically carried over to the Hover style, but we override the Width, Height, and Colour. Then all we have to do is tell an entity using the Skin how it should animate itself. That's it! Anything you set will be automatically animated when the state changes (which is also handled by the backend). This tells the Image to fill itself from bottom to top, from 0 (no fill) to 1 (fully filled), over 2 seconds. This 60FPS video doesn't really do it justice from the actual framerates I'm getting in the editor, but you can get an idea of just how smooth the system is. This sample currently runs at around 4500FPS on my test machine. Anchor; Anchor an entity in pixels, or normalised screenspace values, giving the value from each edge of it's parent container. This is very similar to unity's anchoring system. AnchorLeft/Right/Bottom/Top; Anchor only one (or multiple) edges of an entity, allowing you to keep it in position while giving it an explicit pixel width/height, for example. Pivot; Set an entity's pivot relative to it's full rect, allowing you to anchor it relatively. For example, with a pivot of (0, 0), you could anchor it's bottom left corner to be 16px off the left edge of your screen, and 32px off the bottom, while controlling the rest of it's layout via width/height. You can have entities handled via builtin layout systems. These include your basic horizontal/vertical layouts, which have scrolling variants. You can also mask layouts very easily, transforming them with just a couple of method calls. There are even WPF-style grids with row and column definitions. It's always easy to get your UI looking exactly how it should be. Masking is another big feature. Per control, you can create upto 16 masks per depth level, across upto 5 depth levels. This is a hard cap, but I don't imagine anyone will need close to this amount. Again, this is per panel, so this limit only applies to things you draw in the same control. Why the limit? Well, it supports full alpha (8-bit) masking for all of these entities, with one drawcall. This, as far as I am aware, is the only UI system which supports this feature. You get one drawcall for all geometry, and you get one drawcall for all text. All of this data has to be packed into a texture, which is where the data limit (64bpp) comes from. RMGUI ships with it's own text rendering engine, which works on a hybrid MSDF/bitmap system. Shown here is my system on top, vs a UGUI Text component using Unity's native hinted rendering on the bottom, at 96px. It also comes with a kerning generator, which automatically generates char-char kerning pairs. For those of you who don't know what kerning is, it's basically the spacing between letters. You can see how, on the bottom, Unity doesn't place the 'e' under the 'T', even though there is space for it. My library calculates these collisions for you when you generate font assets, giving you the tight kerning shown on top with zero additional work. It's literally a one-click system. You can also adjust the kerning space target (it's 4 pixels here). Currently all atlases are prebaked, but I'll be adding support for runtime atlassing as well. The system is both a performance and convenience feature. 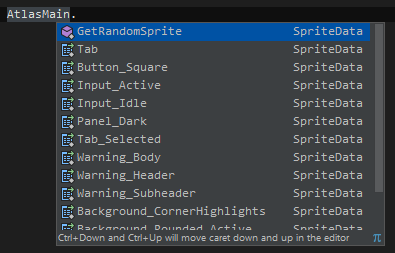 RMGUI supports 9-sliced sprites- in fact, it's a native integration. Just slice it in Unity's sprite editor, and when the atlas is built, it'll automatically read the slice data and handle everything for you. I'm just doing a basic announcement here, so this is far from a complete list of features, but hopefully this gives you a general idea of what the library is all about. Please leave me any thoughts/suggestions, as I'd love to get an idea of who might be interested in using this, and any other features people might be interested in. [DONE] Anchor Layouts; simple flat layout for full control- define the layout position and then anchor all children within that, allowing for overlapping and/or very finely tuned positioning. [DONE] Radial Layouts; place entities in a circle around a point with a defined radius, start angle and spacing angle(s). Draggable/Reorderable Layouts; allow users to reorder Stack/ScrollPanels with builtin drag controls. [DONE] Image fills; this will include linear (horizontal/vertical) filling, radial, and image-based (fade in based on another sprite's alpha) filling. GCat, Novack, TeagansDad and 1 other person like this. There is a quite likely fix for OpenGL. However, it seems that support for logical operations was dropped in OpenGL ES 2.0, despite being there in earlier versions. So I will have to do a separate fallback system for ES, and DX systems prior to DX11.1. I did a nested test with DX12. Shown here is the one-drawcall masking system- the first drawcall is from the underlying camera which is rendering the black background- with 2 depth levels and scrolls (just using some assets from a game I'm working on). You can see that both the main bodies and the white offset icons are masked (I left some light transparency to show that they're cut off on the left). Anyhow, this week I'm building a native rendering plugin to implement the OpenGL fix. This will be used on all targets, not just OpenGL, because it means that I can also operate directly on the unmanaged mesh memory without having to interop via Unity, which will lower overhead across all APIs. Oof sounds amazing. It's crazy to me that you are able to write a rendering plugin that works alongside Unity and adds additional features? I wonder if you will start running into silly OpenGL quirks on some of the crappier mobile devices out there, which may be the reason some of these features are dropped? Well, unfortunately the answer to that turned out to be a big yes. Some are fairly weird software restraints imo (the logical operations I need were supported in OpenGL ES 1.1, but were arbitrarily dropped in 2.0 because there were so rarely used), the rest comes down to what the hardware is physically capable of. I was fairly sure that I could force the original method to work on those platforms, but it turns out there are some critical hardware limitations- even with a lot of low level hacking- and there's just no reliable way to bind the data without full integer RT support. I'm worried that I've maybe misadvertised some of the workflow here. This is a very specific workflow, and it's not feasible for me to layer up separate fallbacks for weird platforms (i.e. for old platforms, I can't just stick another mask on top- the masking system is heavily coupled to the core for performance reasons). I can revisit this in future, but for now I think I have to revoke the idea of mobile support, or else there's a major risk of watering down the main library. Apologies for this, because you were one of the people who mentioned mobile specifically, but from my research I just genuinely can't see a way to make it work without forking the entire thing and building a separate solution for mobile platforms, which I very well may do after release. I want to maintain that RMGUI is a next-generation system, and as such will only target "current"- and, in time, future- generation hardware and platforms. I will definitely revisit mobile support, but I can't make any promises right now as that research turned up a hell of a lot of unforeseen issues. Just to be clear, the approach I was trying will still work perfectly for desktop OpenGL versions. Ouch, that is a big shame! If you were able to target Metal, then you'd atleast be covering a lot of modern devices, from around 5 years ago onwards with OpenGL3/Vulkan and Metal. Atleast with that you could gauge whether or not it'd be worth your time to do full blown mobile support with OpenGL2 support. Still excited to get my hands on this and got around with it! If you were able to target Metal, then you'd atleast be covering a lot of modern devices, from around 5 years ago onwards with OpenGL3/Vulkan and Metal. I've read conflicting things on Metal, I'm going to dig through the API but it's hard to say if it's going to support it or not so I thought it best not to mention anything just yet. With Apple's recent changes it's definitely something I want to support, so hopefully I can force that behaviour in. It took some doing, but I have a fully native rendering backend in for RMGUI now. RMGUI is mostly based on unmanaged memory anyhow (i.e. I allocate blocks of unmanaged memory and operate on it via "unsafe" pointers), but before, I still had to interop the vertex and index buffers to Unity whenever they were dirty. Now, I can operate directly on native memory (using my own mesh, material, shader and texture classes) tied to the graphics API, meaning that there is zero interop overhead (it's made a noticeable difference). More importantly, I can get this working on OpenGL now (I have DirectX wrapped up, OpenGL is next but everything is in place, I just have to swap the calls out from d3d to ogl). Please note that this is a first test of the native system, and I need to do some further integration work with Unity. The draw calls shown are not accurate, they're actually doubled because of native profiling- it's actually 1 drawcall from the camera (black background), 1 for the geometry, and 1 extra when rebuilding the mask metadata. So where it says 3, it's actually 2, and where it says 5, it's actually 3. The screen recorder also added about 0.5ms, effectively halving the framerates I'm getting at a minimum (I'm averaging around 3000FPS). Excellent, I was worried you gave up! Oh, trust me, the joys of trying to play nicely with Unity brought me quite close! 90% of it was built in the first day or so, the rest of the ~2 weeks was spent looking at graphics debuggers and swearing loudly. I've been working on image fills, along with some usability features. The end result is the ability to draw a sprite, position it, and smoothly fade it in from left to right over 5 seconds, with just one line of code. This still fits into the single drawcall system- sprites can be filled with different fill modes in the same control, in the same drawcall. This is just a quick first iteration, I'm going to add smoothing options so you can fill with a gradient edge, radial fill, offset fill (filling from a certain point along the sprite in both directions), and image-based fill (filling based on the alpha of a secondary sprite). aklgupta and Prodigga like this. First test of the animation backend. I need to work a few things out with it but it's fully functional, and you can animate everything from scale and colour to sprite fill values and padding. That's all the code you need to create the animation shown in the video. Oh, and again I should add that the screenrecorder I'm using, because of the involved high framerates, is somewhere about halving what I'm actually getting. This test is running at a solid 4000FPS+ on my machine, often at 4500FPS+, during a full rebuild every frame. JustTheCoolDude, aklgupta and Prodigga like this. For a couple of months now, I've been working on a UI library for Unity (also still working on my networking library, I was building a test project with it which spiralled into a whole new project... ended up working on a UI library from scratch for it). Long story short, I generally don't like building GUI. I'm a programmer, not a designer, and I don't want to have to drag and drop layouts by and hand wire references up in the inspector. Things break easily, it's cumbersome, and it makes the job take way longer than it needs to. So RMGUI is, in short, a UI library for programmers. If you're familiar with IMGUI, you'll feel right at home here. It's straightforward, very powerful, and incredibly high performance. Code generation builds a const database for all of your atlases so you can grab assets with code completion. You never have to manage references or texture lookups. Anchor Layouts; simple flat layout for full control- define the layout position and then anchor all children within that, allowing for overlapping and/or very finely tuned positioning. Radial Layouts; place entities in a circle around a point with a defined radius, start angle and spacing angle(s). Looks cool! I saw you have your own versions of Begin/EndHorizontal(). If you haven't already, you should add "scope" versions of layout controls. It also exposes all of the usual overloads, so while you can't access it once it's created due to the nature of usage, you can supply it with skins and layout definitions when it's constructed. First iteration of radial layouts done; simply specify a radius, start angle, and spacing angle (which you can manually adjust on-the-fly) and all the children will automatically be snapped to the correct position by their pivot. I'll tie this to the animation system so you could easily do an effect where a bunch of elements in a circle smoothly zoom in and out on mouse hover. You could also animate the start angle to have a set of elements rotate around a centre point. Edit: like that... needs some smoothing, but you get the idea. I need to port the text rendering over to native still so I don't have any labels right now, but I implemented a couple of controls to show how UI feedback works. Once the text is back up, I'll be extending these controls so you can pass in some text and have them drawn alongside a label, as with EditorGUILayout. Here we draw a slider, with a minimum value of 15, and a maximum value of 75, and a slide toggle (think of a checkbox with a moving thumb instead of the thumb becoming in/visible). Got those graphics sorted, and did some more contextual interaction work. While interacting with a child entity- the Sliders, in the video- the hover state is maintained for any parents in the hierarchy. I've spent most of the day reworking some core aspects of the backend for additional performance gain, especially around piping data to the GPU. Sliders are now totally finished. You can supply a fill image as part of their style wrapper, which can be handled either by the GPU (sprite is drawn at full width, and then the GPU does a pixel fill on it), or as a sliced sprite (i.e. a 9-sliced fill sprite is stretched along the fill). This automatically adjusts to end at the pivot of the Slider's thumb. They're also automatically smoothed together, so there is never any desync between the thumb and the fill. As shown in the video below, if the user clicks a spot on the slider, it smoothly sets itself to match the current mouse position. Also, the mouse delta is only taken into account if the user is within the bounds of the slider on it's target axis. In other words, for a horizontal slider (you can also make vertical sliders, just call `DrawVerticalSlider` instead), the mouse input is only accepted if the mouse's x position is between the Slider's rect's x bounds. I've done a full rebuild of the multithreading backend. It was using System::Threading::ThreadPool and there were a few native issues arising from it not executing immediately in some cases. So there's now a custom ThreadPool just for rebuilding, where at the beginning of the frame, any dirty Controls are rebuild on a thread pulled from the pool, and then they are forced to converge before the end of the frame, when the Camera is manually rendered by the system. This has fixed all of those issues, and it's generally more smooth as before I was allowing an immediate render to go ahead if not finished in that frame. In other words, rendering has to wait for all of the threads to exit in the same frame, so rather than rendering multiple frames while still rebuilding in the background, it has to wait the ~0.2ms in this demo case before rendering, so you get more predictable results. Again, this happens at the beginning of the frame so in a normal game where you're talking about upto 16ms per frame for 60FPS, there will be literally zero overhead for rebuilding or waiting on the main thread. Also shown explicitly here is the internal Camera system. The "Main Camera" is passed to RMGUI::Initialise, which binds it as the target and then sets up false projection matrices. As you can see in the video, that allows RMGUI to use your Camera to render both the gameworld in perspective, and the GUI in orthographic. This prevents Unity from doing any duplicate culling work, etc. (which saves about 0.15ms in my test cases, compared to using 2 Cameras). You'll probably notice that the text in the video is messed up- I've only just ported it to native. I wanted to wrap the architectural refits up first, but I'll now be going onto the final text engine, which could take some time. Once that's done I'll be able to implement control labels, and get all of the EditorGUI-style inputs replicated. Been out of office for a week or so but I'm back now. I was working on porting the text rendering engine to the native plugin, and I came across a few legacy issues which I've since resolved. Below is a comparison between the same string, in the same font, rendered at the same size with RMGUI and Microsoft Word. You can also see the automatic kerning generation at work here, with RMGUI packing the letters together to fit as closely as possible. I've still got quite a few things to do on this front, but after that it's onto a new text input system, and linking labels to controls. I can then finish the control library, so you get the full range of controls the builtin Editor IMGUI offers, but, of course, for game UI. Got something a bit more fun to show today. And that's everything. The panel will now be drawn in worldspace with the provided plane (which can be updated at runtime, whenever you want). You can set the PixelsPerUnit property of a Control to define how many pixels will be put into 1 Unity unit; this defaults to 1000. In other words, if we drew a panel with a width of 1.92F, and a height of 1.08F, we'd have a 1920px*1080px worldspace panel. And the panel we're working with is 1000px*1000px. I need to sort out mipmapping on the native side, so the textures are highly aliased here, but the core system works. You can now go from screenspace to worldspace in literally seconds. Edit: Bit of a silly example, but just to show how I've converted the single-drawcall masking to work in worldspace, with extreme depth spacing to show the physical structure. Rtyper, JustTheCoolDude, SugoiDev and 1 other person like this. Just doing a little more work on the 3D front. Shouldn't be too long before I can start putting together some fancy animations and start showcasing what's possible with the library. First up, I've refined autosizing a little more. The only set value here is the size of the radial sprites, while the container panel is anchored to 3 edges. In other words, it doesn't have a set height value. Instead, the height is automatically calculated from it's visible children. Here you can see how the container resizes itself when one of the children expands. I've also done the first iteration of Entity rotation. Layouts can project the rotation of children early so that they can react to child rotation while placing them. Here you can see the same reactive setup, firstly with a (0, 0) pivot, and secondly with a (0.5, 0.5) pivot. I've done quite a lot since the last post, mostly on the backend. These additions have made it really easy to build precise controls, as shown below. This is a slider, with very precise fill and thumb layouts. The container sprite is sliced, as is the fill (which is half the height of the container), but the thumb is a normal sprite, although it needs to be positioned so that it's centre left point is at the thumb position. The entire thing is skinned with the following setup. I've been piecing a few of these together as demos, hence the comments. I have a procedural mesh backend in place now, which will be extended to things like splines, so you can dynamically draw 9-sliced line links between elements, and graphs (eventually). I've done a quick deploy test with a radial set (you can set the resolution to go from everything from a hexagon to a 256-vertex high-resolution circle), so you can draw high-definition shapes without having to store and scale them with huge textures. In line with some work I'm doing on this, I implemented radial fills. You can set the direction (clockwise/counterclockwise), start angle, and smoothing values. I'll also be doing 90/180 fills like UGUI has. Starting to get somewhere now. You can build some pretty complex layouts, mixing radials, stacks, controls, and rotation hierarchies. I need to do optional non-pixel perfect movement (you'll notice the animations are very snappy in the videos because of forced pixel-perfect rounding), so this definitely isn't representative of the final product, but you can get an idea of what's possible here. Also, the circle and ring are fully procedural. They have no sprite assets; they're procedural meshes created with calls to DrawCircle and DrawRing, where a radius (or inner and outer radius, in the case of the ring) is provided, and their colour is set. Prodigga and SugoiDev like this. The last test run highlighted a few rendering quality issues with very thin sprites- the slider surrounds in the video above, for example- so I decided to implement a native supersampling solution to eliminate these issues, which you can globally disable, or set at 2x, 4x, or 8x, through the main RMGUI class. This does not affect anything else in the scene; it's totally dedicated supersampling for the UI, making it significantly cheaper than just dumping full screen SS on to solve those issues. JustTheCoolDude, Guerro323 and DeadNinja like this. looks good. can't wait to get my hands on it. all the UI solutions I've seen so far perform awful. First standalone build; 1920*1080 screenshot. I've been making quite a lot of improvements to the text rendering engine this morning. There's still some work to be done, but small glyphs are now significantly clearer. Guerro323, roykoma, Prodigga and 1 other person like this. The core is now mostly wrapped up; everything from here is more or less down to usability, and additional layout features. I do still have a few new modules planned, but I'll be concentrating on refinement and usability for at least the next couple of weeks. Just to kick things off, I've began work on an RTF-like system for all text handling. I might also implement RTF blocks directly, but for now it's a new op-based system. The idea behind this is to let you draw complex text sequences with a single string, through a single text Entity. An escaped backslash, followed by an opcode, followed by a value (if necessary), ended with a final escaped backslash. This will initially be extended to colour; I might follow it up with things like dynamic alignment agaibst the layout type (i.e. dynamic vertical alignment for horizontal text). Please do leave any thoughts/suggestions; I'd like to implement as much as possible on this side. Just any thoughts on what you would like to see, and/or what features could be added to make developing UI easier in general. I'd like to hit the ground running at launch and ensure that as much is covered as possible. JustTheCoolDude, DeadNinja and Prodigga like this. entities have simple interaction quads calculated, and then a very fast Möller-Trumbore implementation raycasts the target primitives (which are prepartitioned).For complex geometries, such as the ring/circle, the resolution is stepped up, and it's final geometry is tested. When atlases are built, their transparency data is bitpacked into an alpha atlas, which is interpolated for testing, meaning that raycasting can also handle precached alpha values (optional per Entity), meaning that you get full raycast transparency support with effectively zero overhead. I might also set up the atlas to accept custom interaction data, so you could specify the pixels to be used for raycasting (in case some transparent pixels should be selectable, while others should not). Frontpage of /r/gamedev last week, thanks to everyone for the support! I've been doing a lot of optimisation work this week around partial rebuilds (to make sure the absolute minimum amount of work is done when Entities become dirty), so there's not a lot of flashy stuff to show, but I have done some more procedural work. This week has seen a major refit of the rendering backend, around shader and material handling. It's now incredibly easy to add your own shaders. Shaders are written in HLSL as opposed to Cg/ShaderLab, but I've included a few decorators- you can use all of Unity's blendmodes and blendops, for example, with #blend and #blendop tags (as shown below). This makes working with materials very easy. Let's take the existing demo, and set the centre circle's material to use this test shader. Note that everything is still one mesh, but the system intelligently packages everything to use the minimum amount of context switches on the fly, drawing the mesh with multiple fragments to allow dynamic materials per entity. Those factories really do improve ease-of-use. As you can see, to get this working, all we have to do is call CreateMaterial (in the base Control class) and hand it our shader, then we can set any Entity's material to use this. So, super quick test- I've replaced the existing transition system with a very robust animation framework, which now represents all entity states as keyframes. The old transitions system now works on top of this system, and allows you to easily animate any Entity. The EntityAnimation is a simple keyframe wrapper which lets you provide skins, along with timestamps (and optionally additional settings such as varying interpolation modes per transition), to form animation sequences. This makes it very easy to compound clips together into animation objects, but you can also provide a skin directly if you only want to animate to a new skin. This is all handled through Entity:: PlayAnimation. You just pass a clip or skin to this method, and the backend takes care of the rest. You can also call Entity::LoopAnimation to indefinitely loop an animation (until it's interrupted by a new animation), or pass in a count to loop the animation a set number of times. This is just using a Color32.Lerp, so the results aren't great, but I'm also working on a custom colourspace system for each Entity, which allows you to also lerp in HSV, CIELAB, and CIELUV (it's fully functional, just got a couple of edge cases to address). The animation framework is pretty much finished now, and I'm really pleased with it. You can keyframe basically every entity property now, and there are derived skin classes for procedural entities. The animation itself is very straightforward. We specify a base keyframe at time 0, and then a final keyframe at time 2 (seconds), and set it's InterpolationMode to CubicOut to give it a nice slowing effect as it progresses. The ColorUtils.Copy call is provided by the library- it's just a way to take a base colour and set only some of it's properties- in the case, I use it to set the alpha to 0. This is just so we can use a style colour, rather than having to type it out multiple time, and then change it everywhere if we want to update it. mons00n and Prodigga like this. Honestly a bit in awe at this! Everything looks incredible, and the whole transition/animation system is a lifesaver. All the examples here are using mouse control for interaction I notice. Have you got plans for keyboard/gamepad as well? I've ended up writing my own set of control components for UGUI to get around the kinda broken keyboard focus system it uses, but I'd love to switch to this someday! Any idea when you might be releasing it? Thanks, really glad to hear you like it! This is going to be one of the later features, but yeah- it'll be in at release. I just want to get all the core elements refined first to make sure I don't end up having to change the mapping down the line, but what I'm currently thinking is after the UI is built, calculate a sort of internal flowmap which defines what happens if you move left, right, etc. I'd also like to provide some sort of system to create control groups, which you could navigate separately. For example, you might have a bunch of buttons which control a series of tabs/panels- you could group all the buttons into a control group, set that as the active group, and then have the controller triggers (for example) cycle through them. I'm also thinking that there should be no controller-specific bindings. Instead, you would just call (something like) RMGUI.Navigate(Direction.Right) to select the closest entity to the right, if available, else try to move to the next line down, etc. That way, you can interface with any control scheme by just calling a few methods. This way it would also work with a keyboard alone, if you wanted to navigate without a mouse for whatever reason. As for release, I'm hoping to have the rest of the planned features wrapped up in a couple of months, but I have a habit of chasing rabbit holes so I really don't have a specific date yet. I do a lot of testing in-house, but I'll probably do an earlier testing version with a small group to iron out any bugs I've missed, then look at an asset store release from there. I've had a lot of questions over the past couple of days, especially through reddit, and I'm really pleased to hear what has been overwhelmingly positive feedback. So a big thanks to everyone who is following along! I didn't link back here, so just for the people following this thread only, I grabbed some 1080p footage of the new animation backend. I also just wrapped up some (kinda weird) clamping features you can enable for layouts. I'm using sliced sprites with highly irregular borders, so when they're really squished up you get some overlap, but that's inevitable. You wouldn't get this with regular slice borders, but I thought it could be pretty handy either way.